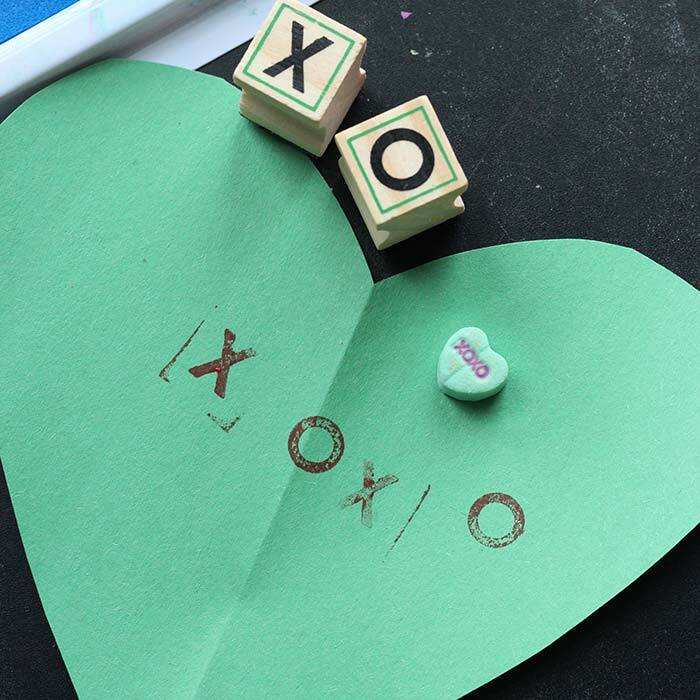 Make paper conversation hearts with this fun craft and learning activity for preschoolers! I have a confession. I have a total weakness for conversation heart candy. I can never resist when I see the Valentine's Day goodies in stores and the first thing I head for are the sweet little hearts with the fun sayings printed on them. And when I spotted them for the first time this year, of course I had to grab a bag. 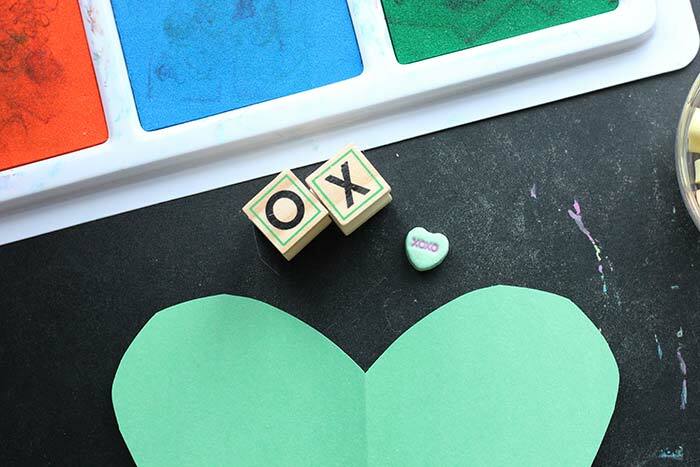 Last year, I used them in a fun Valentine themed discovery bottle and this year I decided to use them for a super fun letter recognition activity, that also works as an easy craft project to make Valentine cards or decorations too! This project was inspired by one of my sons' new found love of Boggle Junior - the preschool version of the classic game where you try to match the words on a card with the correct letters on cubes. We got this for Christmas this year and have been playing it non stop ever since. Then, when I spied my favorite little hearts in the grocery store, it reminded me of the game. 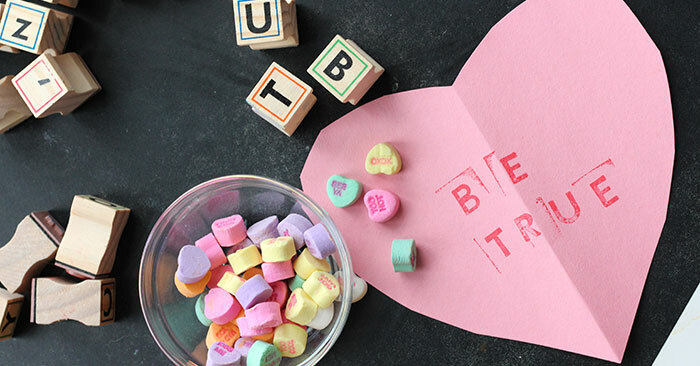 I thought we could have some fun matching the words on the candy and creating our own paper hearts at the same time. 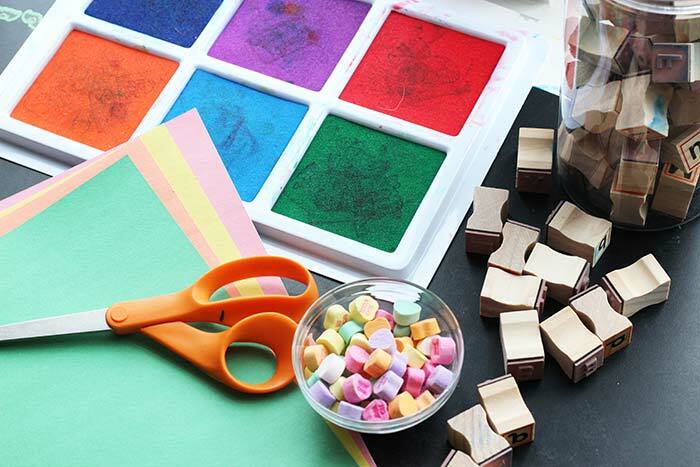 Here's what you need to recreate this activity at home. Start by cutting large hearts from your construction paper. Then set them out along with your alphabet stamps, ink pad, and bowl of conversation hearts and invite your children to play. 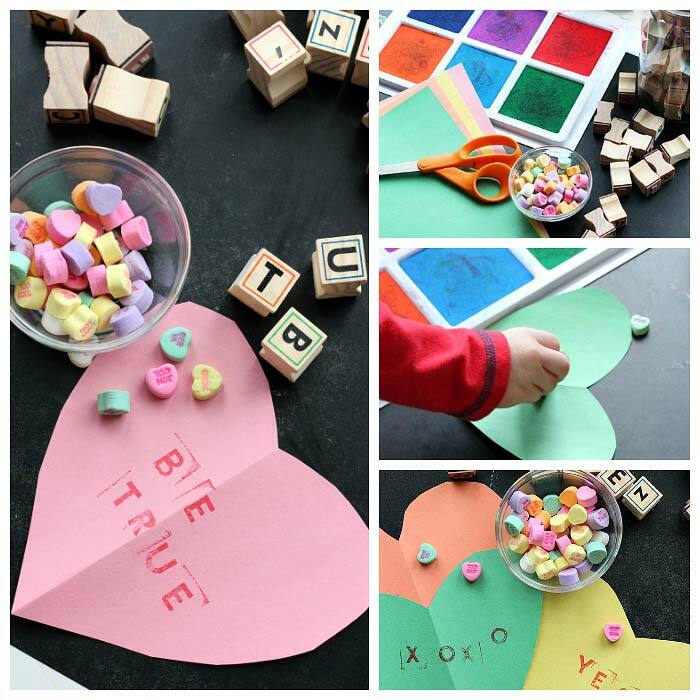 Have your child choose a candy heart from the bowl, then choose a corresponding colored paper heart. 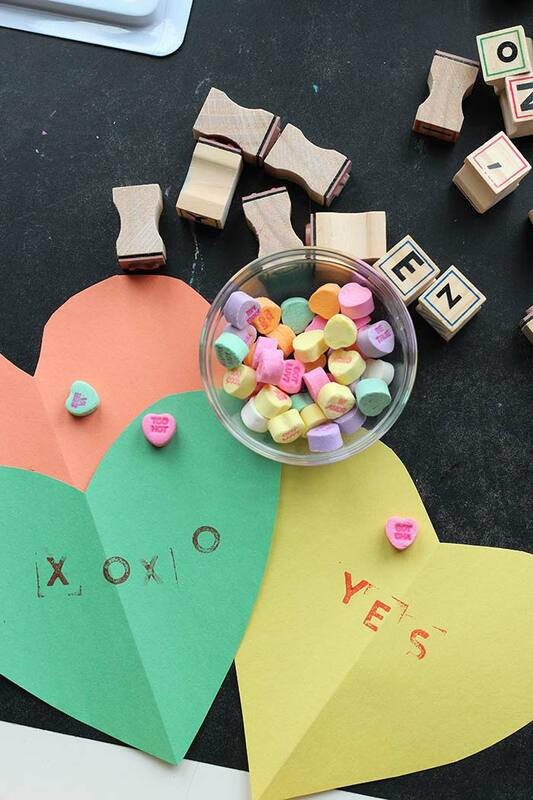 Then encourage them to use the alphabet stamps to recreate the words on the candy heart on the paper. My boys had so much fun with this! 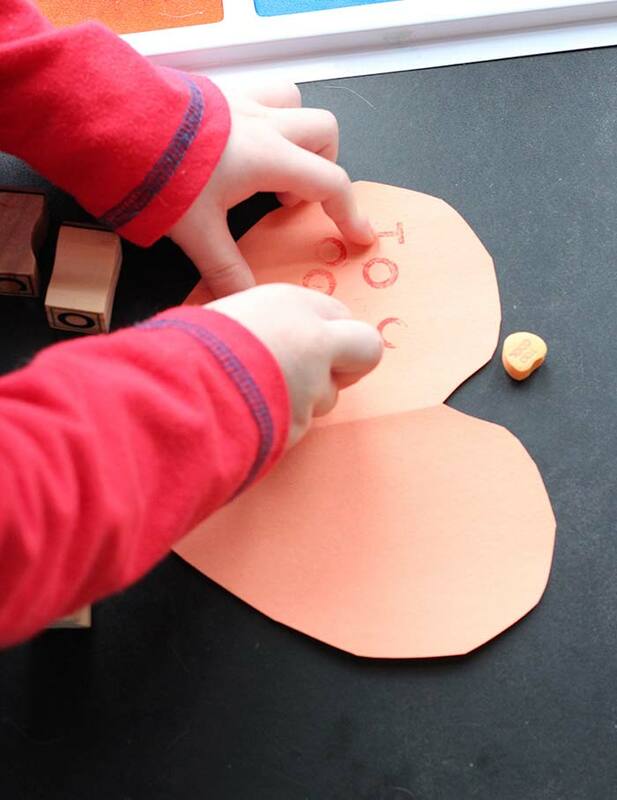 They loved creating their own hearts by finding each letter and stamping it onto the paper. This was a really fun way for us to practice our letters, and as they chose them, we practiced what each letter sounds like and worked on sounding out the words together. And as a bonus, they got to sample the candy hearts too. 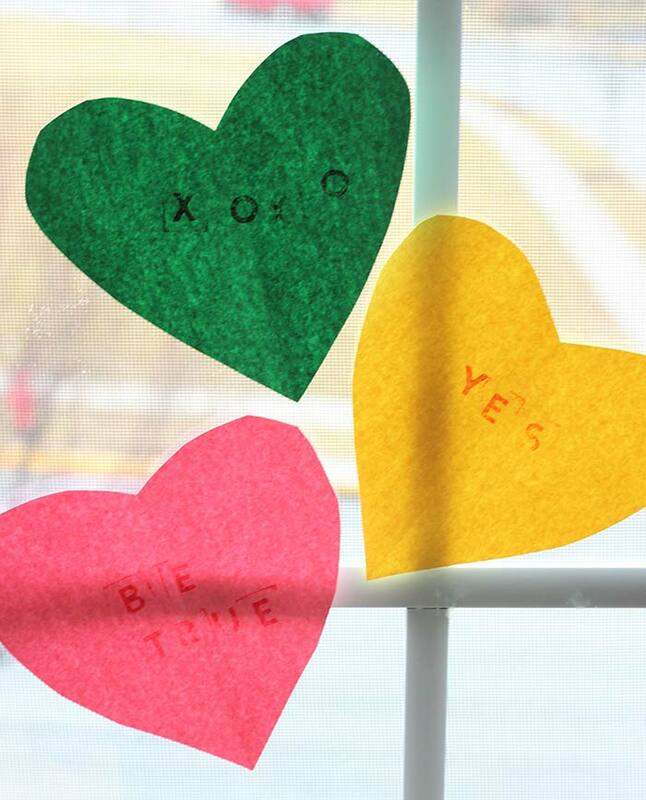 And when we were finished, we had a super cute set of paper conversation hearts to decorate our playroom window! They would also make great Valentines for friends or family. This is just one of the many Valentine's Day activities that we've enjoyed. If you like it, you should also try our Shake It Up Hearts no mess painting craft or our heart themed Valentine Matching Memory Game too! 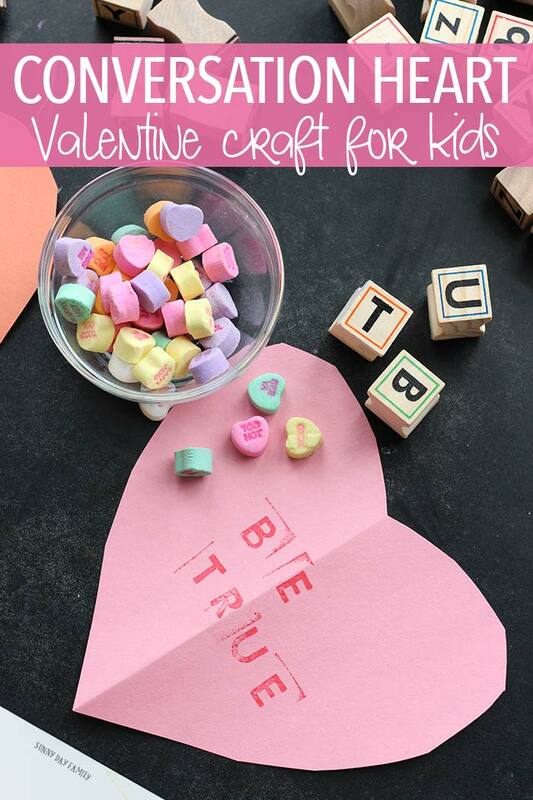 Or grab these printable activity Valentine cards to entertain your kids or to hand out at school. 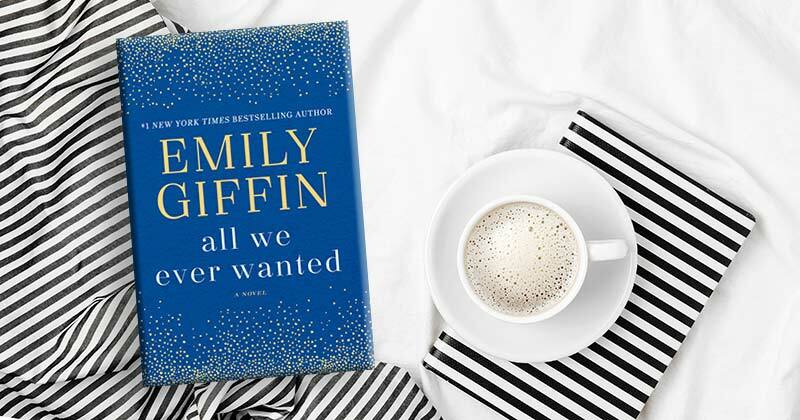 Enjoy one of these fun Valentine's Day books after you finish your crafts!